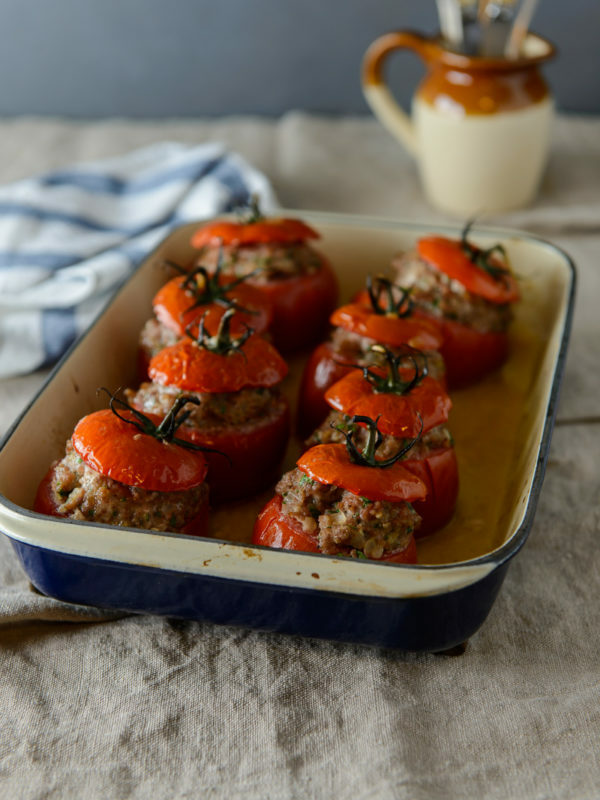 My Mum would serve these sausage stuffed tomatoes in winter when I was growing up, using big, juicy tomatoes from the south of France. The hearty sausage stuffing makes it a filling meal, especially served with plenty of bread to dunk in the pan juices! I listed minced pork for the filling but you could use a combination of pork and veal, or just all beef. Trim a thin slice from the the bases of the tomatoes so they sit flat in the pan, cut about 1 cm off the top of each tomato to make lids. Using a teaspoon, carefully scoop out the seeds and discard, making sure not to break through the base. Sprinkle the inside of the tops and bases with salt and stand, cut-side down, on a tea towel for 15 minutes — this helps to draw out excess liquid. Heat the olive oil in a heavy-based saucepan over low heat. Add the onion and garlic and cook, stirring occasionally, for 5 minutes until soft but not coloured. Place the minced pork, egg, parsley, breadcrumbs in a large bowl. Season with nutmeg and 1 tsp each salt and pepper, and use clean hands to combine very well. Add cooked onion and stir immediately to incorporate. Turn drained tomatoes upright and place in a roasting pan. Divide the sausage stuffing among the tomatoes, pressing into the base and mounding slightly over the edge, then top with the lids. Drizzle with a little extra olive oil and roast for 30 mins or until sausage is golden and cooked through. Spoon pan juices over tomatoes, season to taste with a bit of extra salt and pepper (if necessary) and serve warm — with crusty French bread if you prefer. 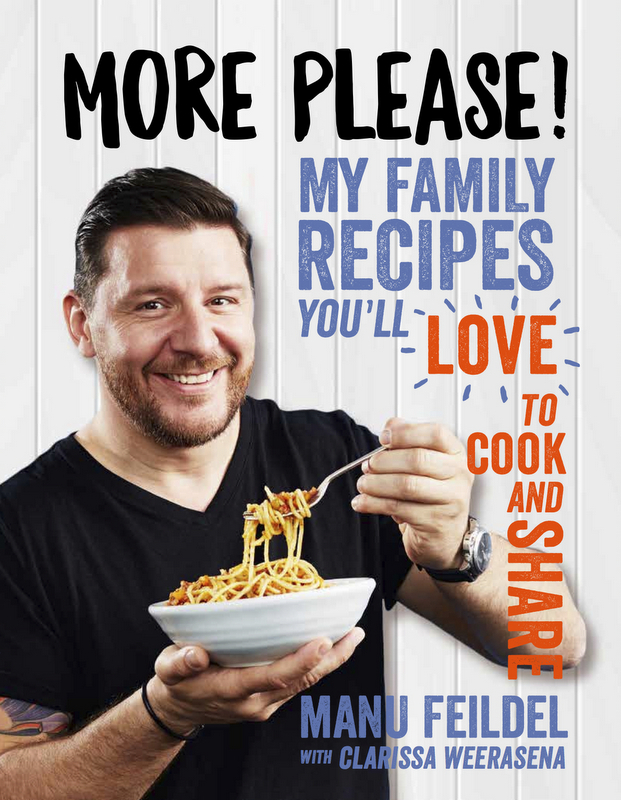 As seen in my first book Manu’s French Kitchen — recipe by Manu Feildel, published by Murdoch Books Australia. Photo credit Jennifer Jenner.